Shatter Fates expansion of Shadow Era has brought to us many new Heroes. In my continuing adventures to find unlikely pairings that actually work together I attempted to match Bloodfang with a non-Wulven alliance. 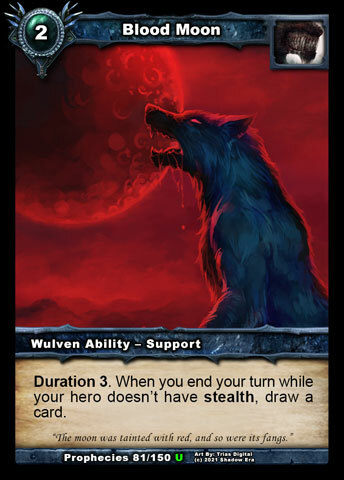 Bloodfang’s ability forces him to play with Wulven allies to max the potential of his Shadow Energy ability creating a great challenge for me. I decide pairing him with Undead would be a good test since they are easily the most developed and synergistic tribes. The general deck building game plan was to take Bloodfangs ability and use him in a similar way that Baduruu does with weapons. 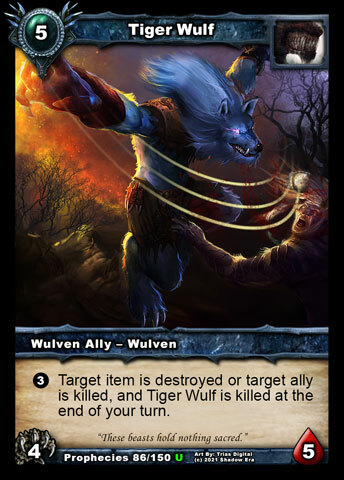 Bloodfang will use his ability with the Wulven alliance allies being his weapons so I’m going to be using 7-8 Wulven allies and building around them with Undead alliance as the core deck theme. 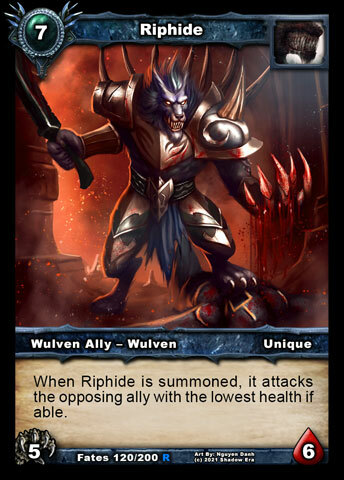 The Wulven allies I’ve choose are Riphide and Tiger Wulf. I feel these are the most impactful allies (currently) for this type of hybrid build. Riphide’s ability has an immediate impact and he has strong stats to maintain a threat in the board. Tiger Wulf does not have an immediate impact on the board but he has a flexible ability and good stats making him a strong secondary option. The undead alliance has the most synergy since they have been around the longest. I focused on a strong aggressive early game to help transition to the point where Bloodfangs ability can be used since it has a long slow charge. 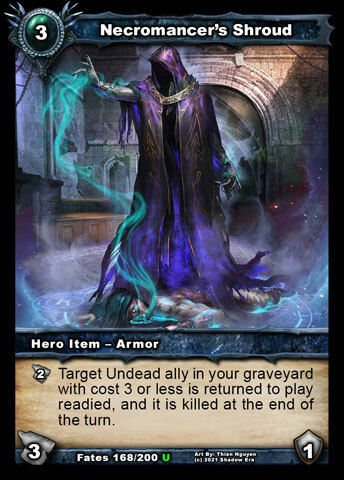 Harbinger of the Lost helps to start the graveyard filling process and then transition into the 3/4 allies (Death Collector and Cryptspawn Tormentor) with support of Death Mage Thaddeus. 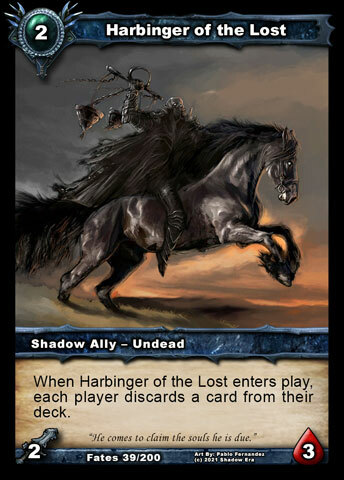 I try to only use Harbinger early on turns 2 or 4 where he can be comboed with the various other great 2cc cards Now You Are Mine and Blood Moon. Death Collector is a good turn 3 card and on 4 he can combo his ability also with Now Your Are Mine or Bloodmoon or advance the board with Death Mage Thaddeus support. 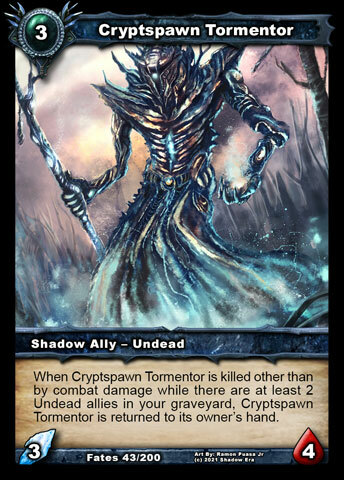 Cryptspawn Tormentor is a better later game ally after his ability kicks in. Good against board wipe opponents and also comboed very well with Necromancers Shroud and Sacrificial Lamb. His build in recycle ability is what we are after. 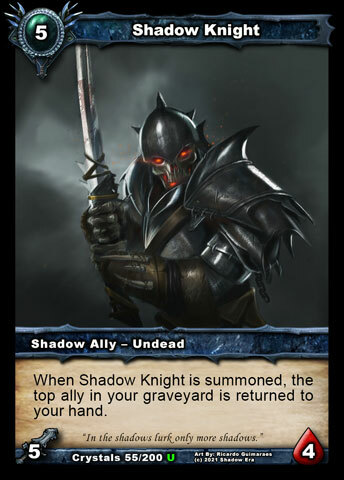 Shadow Knight compliments the deck as well helping retrieve key allies for a matchup and is only limited to top ally in graveyard. Corpse Shifter is a nice complimentary ally for dealing with stealth and he has high health. You can use him with Shadow Knights to refuel his discard damage. 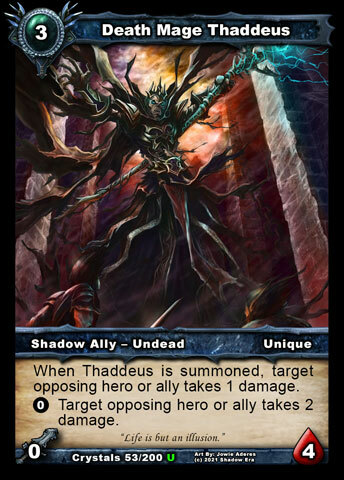 Death Mage Thaddeus also combos very well with Riphide’s summon ability incase you need just 1 HP more damage or to help differentiate opposing allies with same health to assist with targeting. Bloodmoon and Sacrifical Lamb are great draw tools to go along with Cryptspawn Tormentors and Shadow Knights pseudo draws. Necromancer’s Shroud is actually a key piece to the deck. This allows you some additional complimentary pseudo haste damage but also set you up for some combo potentials. There are a couple of really cool tricks I learned with this deck. 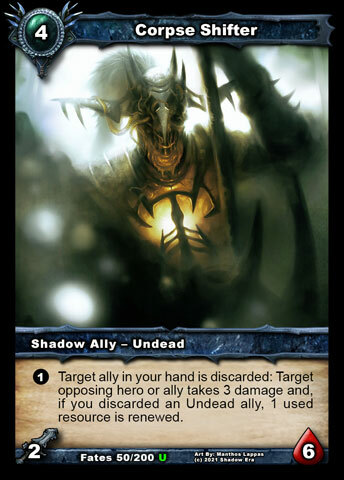 Directly after my opponents has buried one of my Shadow Knights I have used Necromancers Shroud to remove that top ally and then summon another Shadow Knight reinserting my Shadow Knight loop. 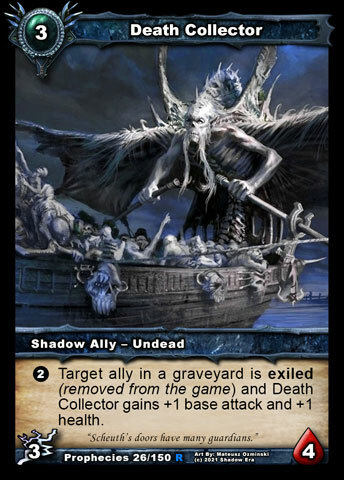 With Corpse Shifter you can use his ability to throw Cryptspawn Tormentor for 3 damage, then use Necromancers Shroud reviving Cryptspawn Tormentor to deal another 3 damage and if he survive he will bounce back to your hand to be used as ammunition on the next turn (great support with Shadow Knights). I had a lot of fun playing with this build and can see there is lots of potential for Bloodfang in future beside just Wulven tribal decks. 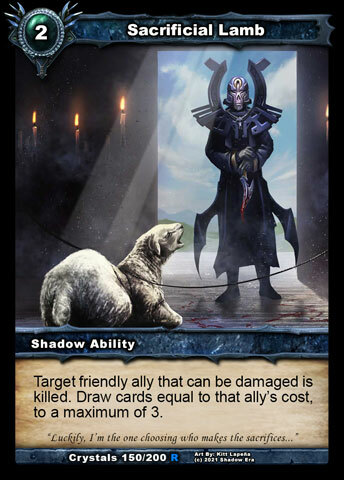 He could be helped by having Wulven allies that can impact the board immediately like Riphide does or something that allows the alliegence tag of his hero ability to target other alliegence a in his hand. Tagged alliance, bloodfang, Shadow era, Shadowera, shattered fates, tribe, wulven. « Bob and Sam Trollin it Up! Episode 6 – The Newbisode!